Roof leaks are a big issue with all types of RVs. If not sealed, replaced or repaired quickly, expensive repairs or full roof replacement may follow. We can repair or replace your RV roof or leaky roof seams with proper professional techniques. Whether you have a fiberglass, TPO, Aluminum or EDPM roof, we can solve your roof leak problem. 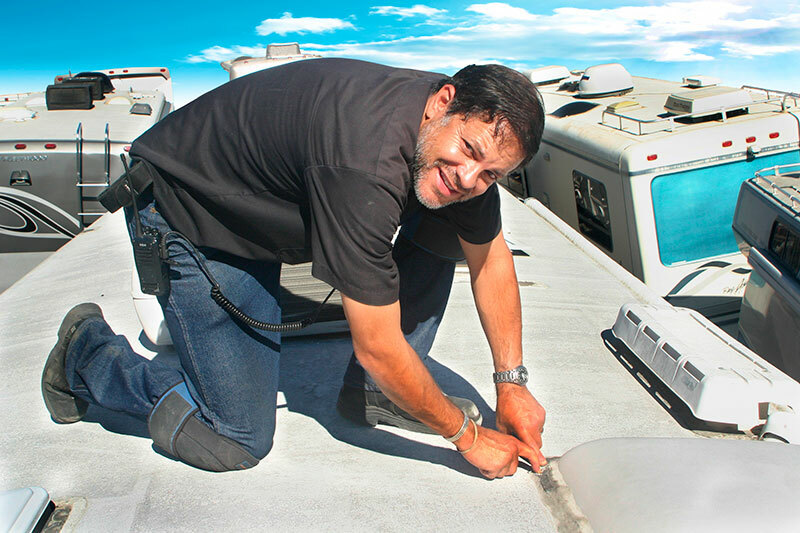 To prevent leaks on your RV roof please schedule a complimentary or free roof inspection. Fill out our easy online appointment request form here. RV roofs should be inspected twice a year to help prevent water damage. The smallest tree branch hit or pinhole leak can wreak havoc over time and cause thousands of dollars in damage. Call us to schedule an appointment and ease your mind about your RV's roof condition. If your RV has already allowed water damage in and you have: ceiling damage or staining, roof rot, mold that you can see or smell, electrical issues because of water intrusion or loose siding or cabinetry, we can take care of that too. The longer the leaks last the more expensive the repairs get! Some insurance companies will help to pay for your roof repairs too. Let us try to help you with your RV roof insurance claim. Call now to get a new roof on your San Jose based RV. Sturken's knows RV roofs - so you don't have too! If you live in: Milpitas, Los Gatos, Cupertino, Santa Clara, San Jose, Morgan Hill, Saratoga, Fremont, Pleasanton, Dublin, Livermore, Danville, San Ramon, Gilroy, or any other part of Bay Area, you can count on Sturken RV Repair to take good care of your motor home.